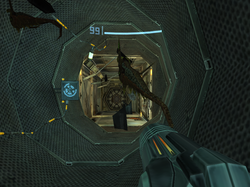 The Air Lock is a very small room on the Frigate Orpheon in Metroid Prime. It connects the Exterior Docking Hangar via the Main Docking Bay to the main sections of the ship. This area can be pressurized and depressurized as needed, allowing individuals to leave and enter Orpheon to and from the vacuum of space. The pressurization mechanism is accessed by a terminal that can be scanned in this room. The door leading to the access hall cannot be opened until the air lock is repressurized. When Samus first encounters this chamber after boarding the derelict vessel, it is in a depressurized state. Dead Parasites and small pieces of debris are floating about in the airspace and will fall to the floor once repressurization takes place; the Parasites can be shot with the Power Beam and destroyed before that, however. After the Reactor Core overloads, Samus escapes the frigate using a new route in which the Deck Alpha Mech Shaft opens into the Air Lock. Door cannot be opened until air lock is repressurized. Use the activation panel to repressurize room. The scan data of the door Samus initially enters in this room indicates that the preceding hallway is called the "Main Docking Bay," but that area on the map is conjoined to the Exterior Docking Hangar and shares its name. This page was last edited on 3 May 2013, at 02:28. This page has been accessed 3,527 times.